Leave the North Palace by going either left or right. Follow the path northward to the lone forest square. Battle through the enemies here and you’ll find a Point Bag worth 50 experience points, allowing you to level up and upgrade your health. Leave the forest and follow the pathway to the southeast to find the Town of Rauru. ~ Rauru Town ~ In each town, there is a woman in red who will restore Link’s health when spoken to, so if you are low, you should certainly look for her. Similarly, an old woman in each town will restore Link’s magic. Walk through town until you see a lady with a purple dress coming out of her house. Talk to her and she’ll tell you to talk with her father. Continue to the basement of the house to find the Wise Man. He will give you your first spell, the Shield Spell. This will double your defense, making you take only half damage from everything when it’s in use. Exit the house and walk to either end of the town to exit. ~ Parapa Desert ~ Walk the northeast of Rauru and you’ll find a small cave, so go ahead and enter it. This cave is extremely dark, but if look at the ground closely, you can see a single Lowder crawling about. Simply stab at it or crouch and use a sword beam if you are at full health. Make your way through the cave and exit back to the overworld. Follow the pathway eastward to the ocean and then head south down a narrow pathway. You’ll eventually bump into a side-scrolling sequence. Jump over the Air Bubbles and try not to fall in the water as that will result in instant death. Back in the overworld, step into the small area of grass. Go right while jumping over the stones. Here you will find an enemy Goriya. Use the Shield spell if you are feeling cautious, and take on the Goriya before you grab your first Heart Container! 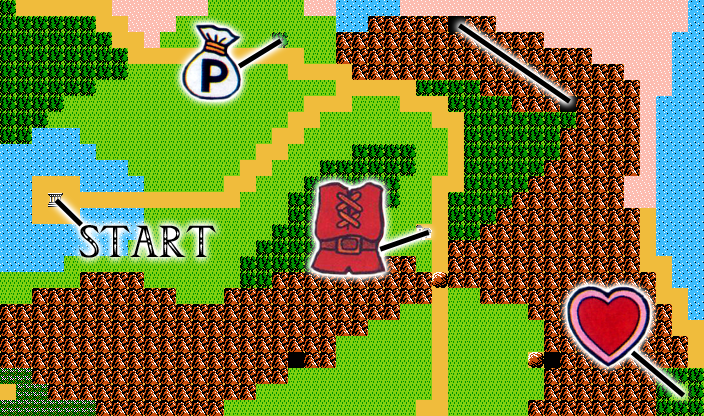 ~ Approaching The Palace ~ You’ll have to backtrack northward, going through the bubble sequence. Once you make it through, if you are severely hurt, you could retreat all the way back to the town of Rauru to fill up your health. Otherwise, travel to the northeast portion of the desert and enter Parapa Palace. It is very easy to get lost within some of these palaces. While this one isn’t overly complicated, some of the later ones could leave you feeling disoriented, so check the map frequently to remind yourself of your location. Take the elevator down and head to the left. You’ll encounter some Tinsuits, who steal some of your experience points upon hitting you. Slash at them once to defeat them and continue to the left. You’ll eventually encounter an enemy Stalfos, so simply crouch stab at its legs to defeat it. At the end of this pathway, slash at the key to pick it up and then return to the first elevator. Walk to the right of the elevator and through the locked door. Continue walking past another elevator until you run into Bubbles, enemies that bounce all around the room. You can either ignore them or attempt to kill them for a large amount of experience, however, it will take quite a while. At the far right end of this floor, you’ll find a Fairy, so jump into it to restore your health. Use the nearby elevator and head up. Go to the right and grab the key that is laying around. Continue to the right and you’ll encounter a Mace Thrower. These enemies do a lot of damage, so use the Shield spell if you’d like to. Wait for an opening in the Mace Thrower’s maces and quickly jump closer to the enemy. Slash away with your sword until he has been defeated. Grab the key and then slash at the statue to make a Red Potion appear. This will completely replenish your magic. Walk back to the elevator and ride it back down just one floor. Walk back to the left and take the elevator down to the lower floor. You’ll find yourself in a room with four Bubbles, the last of which moves quite fast. Try your best to avoid them and continue running to the left. Jump up the stairs and kill the Bots. Each part of the bridge will crumble once you walk on it, so you’ll have to keep moving quickly. Right in the middle of the bridge, there is a Point Bag worth 50 points, but the crumbling bridge makes snagging it a bit difficult. If you feel brave, grab it, and then continue across the bridge and left a screen. This room has another Mace Thrower, as well as an Iron Knuckle, so it would be smart to use your Shield spell. The best way to defeat an Iron Knuckle is to jump towards it and slash with your sword on your way down. If you get the timing down properly, you will hit the Iron Knuckle every single time. Afterward, open the locked door and get the palace item, the Candle. The Candle lets you see in dark caves, making it easier to navigate other portions of the overworld. This item is used automatically, so don’t worry about having to select it. Backtrack to the right and take the elevator back up. Now head all the way to the right to the next elevator, right where you found the Fairy. This time take the elevator down a floor. Follow the pathway to the right, defeating a number of enemies before reaching the palace boss, Horsehead. ~ Horsehead ~ Before the battle, it is a good idea to use the Shield spell. Horsehead has only one attack: swinging his mace at Link. He wears body armor, which makes his head his only weak spot. Jump and slash his head to inflict damage. There isn’t too much to this battle, but it is important not to take it too slowly. If you do so, Horsehead will back you into a corner. With precision jumps and some practice, Horsehead will be defeated. Grab the key he leaves behind and exit to the right. Step onto the statue and Link will place the Crystal in its proper slot. After returning a crystal, you’ll automatically get full health and magic, along with a free level up. Congrats!